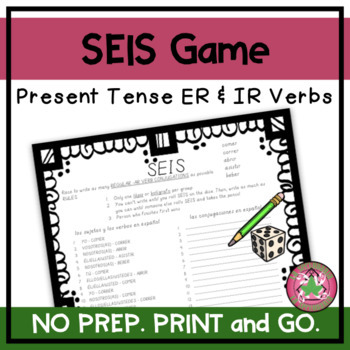 Use this template to play ¡SEIS! with students. ¡SEIS! is a great review game with students. Students will love racing to finish. It gets competitive and students will love it! There are three templates with different images to represent ER and IR verbs. Students will race to conjugate the verbs in the correct forms.